I don’t know many people who don’t want balance between their life and their work. How many spouses have complained about long work hours? How many daughters and sons have gone through their childhood with one or both of their parents working long hours at the office or constantly away on a business trip? The desire for balance is ingrained in our psyche from generations of work that lacked autonomy and meaning. It is a remnant of the industrial era when the distinction between life and work became more distinct. Prior, life was work. The line was between the two was non-existent. In 1899, sociologist Thorsten Veblen published The Theory of the Leisure Class: An economic study of institutions. His research marked a growing phenomenon of people separating their personal life from their work life. Veben was the one who coined the often used term, “conspicuous consumption.” His research marked a growing tension between personal life and work life. This tension is at the heart of the quest for balance. The balance between life and work, I’ve come to conclude, is an impossible standard. It is a measure of time and activity level rather than a measure of the value of either our life or work. 1. How do you know when there is balance between your life and work? Is it a 50/50 split? 2. If you were to achieve balance, what would be different? Is it simply that you would have more time to pursue your leisure time interests? 3. Presently, which side, life or work, is more out of balance? What is it specifically that tells me this? When we look more closely at the relation between our personal life and our work life, we find competitive interests. My personal life and my work life are in conflict with one another. I have personal goals and aspirations, and I also have an ambition to advance in my career. Too often these seem incompatible, or out of balance. When Thorsten Veblen conducted his study, people were just beginning to discover a sense of a individual life apart from work. In his day, the emergence of the leisure class was a sign of growing economic opportunity for people whose ancestors had only known hard work and poverty. If you were smart, industrious and willing to move, you could create a new life. It is no mistake that it was during this time that the Horatio Alger stories were so popular. They crystallized a perception in the growing middle class that hard work focused on personal goals was the route to success and achievement in life. Over a century later, the tension between our private lives and our public life at work still exists. Establishing balance is no longer an adequate answer. Instead, something more radical is. The radical answer is the alignment of our life purpose, values and vision for impact with the work that we do. It is radical because it requires change. 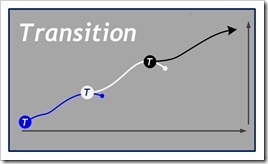 It is not simply finding some trade off between personal goals and career ambition. Instead, is bringing our life and our work into alignment around our purpose, values and vision. It is difficult to visualize alignment between your life and work without clarifying the ideas that connect it all together. I am making the assumption that we are not just aligning our purpose, values and vision within our personal or private life, but really aligning both our personal and work lives together with our purpose, values and vision. The difference matters. It is between a life of compartments vying for influence over the other, or life in alignment around the values that truly matter to us. We are not one person at home and another at work. We are the same persons at home and at work, and the more we align those two halves (The tension of balance still remains. ), the greater impact our lives can have. 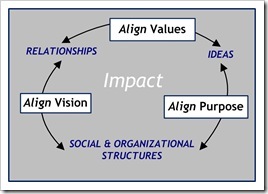 Let’s use the Circle of Impact guide to see how this can work. Purpose: Our purpose is our sense of identity. It is our awareness of who we are; what our gifts, talents, and strengths are; what the social and organizational contexts of our lives are; and, the kind of work that we want to spend our days doing. When our purpose is not aligned either personally or occupationally, then a wedge has been driven between our personal life and work. For ultimately, to have alignment means I’ve defined who I am, and my work is simply a reflection of who I am. If you love the work you do, then you are closer to being in alignment, than you are if you hate what you do. Our purpose is not simply what I can do well. It is deeper than that. Our purpose is rather the difference I can make that truly matters. When we are having an impact, we know it because we find satisfaction and peace of mind. Aligning our purpose with our work is not just doing that which I love and can do. It is aligning it with the right situation where I have the opportunity to create the impact that my purpose identifies. Purpose isn’t just another way of stating how I’m going to fill up my days with activities. No, it is about the impact or difference that I can make.. Values: Our values connect us to people and our social settings, whether at work or away. They define what our standards are, what matters, the boundaries of what is appropriate, permitted and our measures for success. The clearer we are about our values the more likely it will be that we’ll find people who can join us in our purpose. For this reason, it is vital that our values are aligned with our relationships. At the heart of this alignment is trust. When there is alignment, there is trust between people. When there is trust, there is openness, accountability, mutuality, and confidence. These are the relationships that we need in our life and work that enable us to fulfill our purpose. I cannot achieve it alone. No one can. We are totally, absolutely dependent upon other people to contribute to the fulfilling of our purpose. If you think otherwise, then your ambitions are set too low. Vision: Our vision is a picture of alignment. It is a picture of what we do with the people with whom we are in relationship through the social and organizational structures where we live and work to create the impact that our purpose points to. It is simpler than that last sentence, because when we are in alignment, we don’t see the parts, but the whole. We see the effect. A vision therefore is more like a video than a snapshot. It is a view of what we see happening. It is a visual image in my mind’s eye that is a reference point for what we are constantly looking to achieve. It is as much the experience of it as it is the what of it. The best place to start to understand what is your vision is to ask, “What’s changed?” The change you see is the effect of the activities of your purpose and values through people and structures. If there is no change, there is no solution to problem, no resolution to an issue, no growth, no progress, no forward movement. As much as we don’t like change, if you aren’t creating change, you aren’t fulfilling your purpose, and most likely finding that your values have less and less a role to play in your life and work. Alignment is not the same as balance. 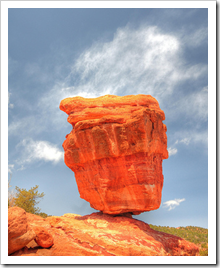 Balance is a picture of the compartments of our life and work in tension. Alignment is the parts of our life and work, functioning together toward an impact that makes a difference that matters. 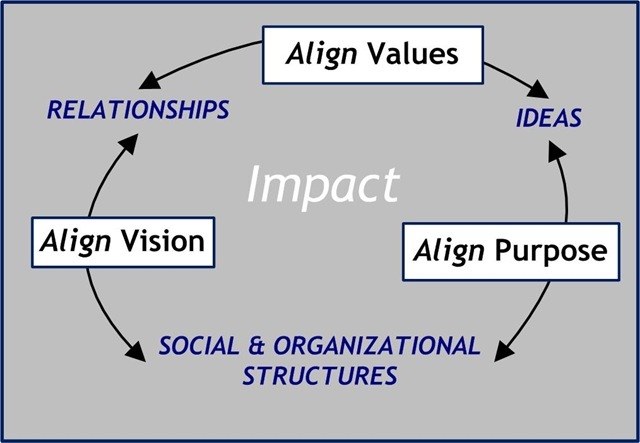 Alignment comes when we connect our purpose, our values and our vision for impact with the people and the social and organizational structures in our life. Start by clarifying your connecting ideas. Here are two simple quesstion to begin. How are you able to live that purpose out in your work? If either one is not clear, then take some time to reflect on them both. What is it that I value and how is it reflected in my relationships? Who are the people that I know that best represent a commitment to these values? Are those values free to be lived out in my work? If you are unsure of any of these questions, then take some time to reflect on them. My advice is find one person whom you trust, and the two of you begin a conversation about these questions. To bring our life and work into alignment is a radical step because it will require change. This is why it is important that we are first clear about our purpose, values and vision, and that we have established some trusting relationships with people who can help us as we begin the hardest work of bringing alignment within the organizational structure of work. You may well find that your work does not define you as a person. If so, what does define you? How can you marshal all the best of what you have to offer to live each day making a difference that matters. To do so may mean radical change. To do so may mean that you no longer live to be a apart of a leisure class for whom conspicuous consumption is the goal. Your vision for impact takes over and guides you to discover alignment in a whole new way than before asking the question you’d never see. When creating alignment, our life and work are in transition. I know many people for whom the daily grind is hard and unrewarding. The prospects of radical change to create alignment is not possible as long as there are children to educate and mortgages to pay. 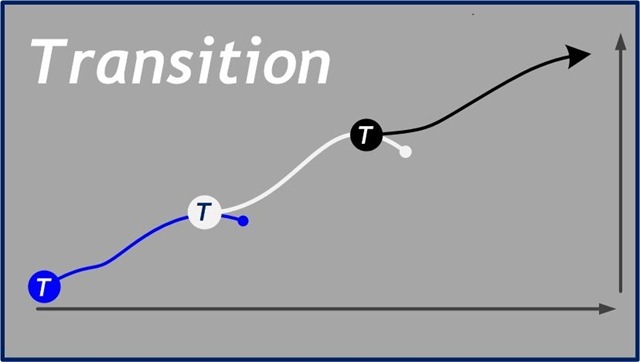 If this is you, then realize that our lives are not stationary, but always in transition from one point to the next. The measure of our lives is not its length, but its impact. Whatever point your life finds you, you can find ways to make a difference that matters. You may not be where you want to be, but you are also not where you used to be. Begin to create alignment and the way forward to a higher level of alignment will show itself. Live through the tension of finding balance by creating alignment. Do so and both your life and work will open up to new opportunities. Keep thinking “What is the difference that I’m making here that truly matters.” Keep asking that question, and the way to alignment will be discovered each day. Tagged with alignment, balance, difference that matters, Horatio Alger, ideas, impact, leadership, life, organizational structure, purpose, relationships, success, tension, Thorsten Veblen, transition, values, vision, work. Ed, work and life alignment is SO at the core of what we all strive for – yet surprisingly very few have adopted an approach that works for them in this regard.